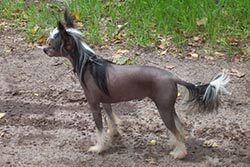 Most people only think about "naked" dogs when they hear about chinese crested, but that's not true. 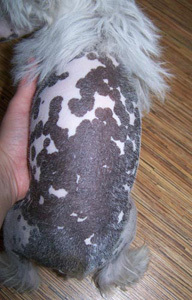 There are Chinese Crested with and without hair. 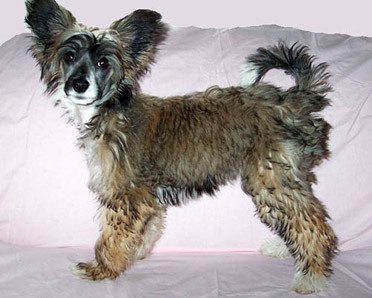 The Chinese Crested has two varieties, the hairless and the "powderpuff". Both varieties can be born in the same litter. The powderpuff and the hairless variety can be littermates when both father and mother are hairless, or if one of the parents is powderpuff or hairless. Only by mating a powderpuff male and female together you are ensured of only powderpuff's. You can tell from the minute they are born which pup is a powderpuff and which pup is a hairless Chinese Crested. A powderpuff is a lovely elegant little dog with a silky coat. The coat can have all colours. The coats can vary for very long to a bit shorter. Some have very heavy coats, others have thinner coats. But all are of a silky texture and always feel nice and soft. Powderpuff do hardly any shedding and are therefor ideal pets in the house. Of coarse some dead hair falls out and with combing you will comb out some hairs. You should check your powderpuff on matts. If you lack this then the coat will get matted worse. This is no fun for the dog, nor it's owner. You carefully pull out a matt with your fingers. You should be carefull with combing. I comb my Powderpuff twice a week. If you do this and bath your powderpuff at least every other week it is enough to ensure a beautiful fur of your powderpuff. Most powderpuffs have a shaved neck and muzzle. In the Netherlands this is the preferred look for a powderpuff. Although there are powderpuffs with a fully hair-grown muzzle. The ears can be erect or hanging. Both are approved. Hanging ears are only correct for a powderpuff. 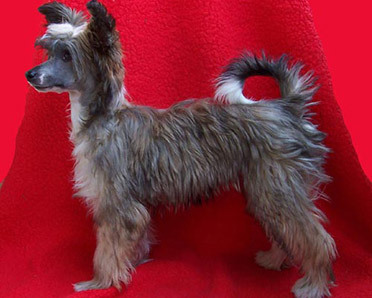 Hairless Chinese Crested need to have erect ears. For a lot of people who are looking for a small, lovely and sweet companion dog, but do not like the exotic appearance of a hairless one, a powderpuff should be the ideal dog. Unfortunatley the name scares of a lot of people in the first place. 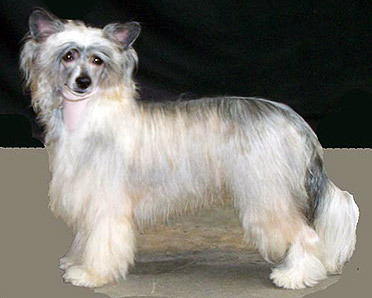 But now you know there are also Chinese Crested with lovely coats. If you are looking for a elegant dog who loves attention and who can be with you where ever you go, and you do not mind grooming your dog yourself? Then the Chinese Crested is the perfect dog for you. I could never have another breed. The Chinese Crested are my sunshines in my life. 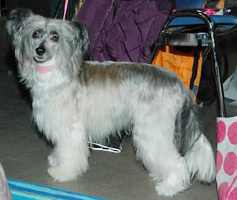 A Chinese Crested does need grooming. The hairless variety needs to be bathed once a month and shaved almost every other week. When it is really cold they need protection from the cold and have to wear a coat when going outside. When there is a lot of sun they need to be protected against sunburn with suncream. The Powderpuff needs to be checked on matts every day. Also a powderpuff has to take a bath at least once a month and needs to be blow-dried. The muzzle of the powderpuff needs shaving every 2 weeks. 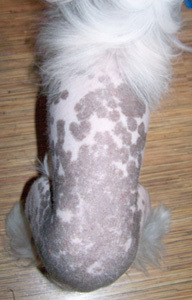 Chinese Crested differ in witherheight from 10 to 13 inch. They weigh about 5 to 12 pounds. They look gracefull and elegant and their movements are as beautiful as that of a horse in extended trot. The Chinese Crested is a lovely companion. They are super intelligent and will do anything to please their owner. They are really gay and allert and love attention and playing. They can be some what restraint towards strangers. They are not "all-day-barkers" but will let you know when they hear something strange. Most Chinese Crested like to stay as near to their owner as they can all day long. My dogs do not mind being alone, but of course it is was they are learned during their young years. They are very tolerant of other animals and childeren. 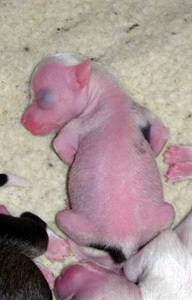 The hairless pups are born with hair on their head, tail and paws. 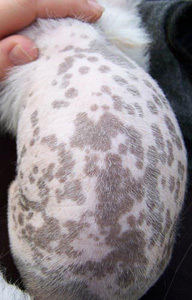 There is a difference in the quantity of hair on a hairless Chinese Crested. A "true hairless". Has a little bit of hair on its head and paws. A true hairless needs te be shaved the least and sometimes not at all. A "medium hairless" has a bit more bodyhair then a "true hairless". There for it usually has a bigger crest and more hair on its paws and tail. 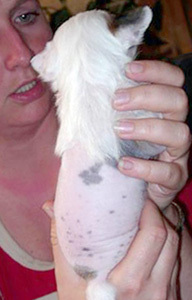 A medium hairless has unwanted hair, mostly growing on the top of its back. You need to shave this type at least every other week. A "hairy hairless" has furnishing everywhere and there for needs to be shaved every week. They hairy hairless has the most beautiful crest, sox and plumes but needs a lot of grooming. The furnishing is not to be compared to the coat of a powderpuff. 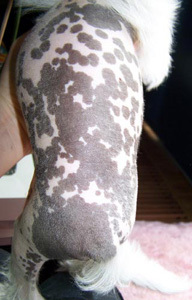 Hairless Chinese Crested have a single coat while powderpuffs have a double coat. The Chinese Crested can live everywhere, as long as it is indoors and nice and warm. They love to sleep in your bed underneath the blankets, were it is warm, or sleep on the heater. The breed adapts very easy to its life. They do not need a lot of exercise, but they do love long walks. You can also give them great pleasure by letting them run lose in open fields or wooded area's. But if your time to walk them is only short then they will just go along and be happy anyway. Just remember that every dog needs its longer walks. 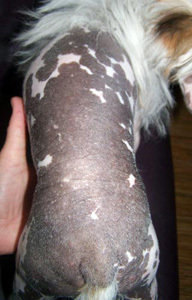 Sometimes the Chinese Crested dog can be a pet for people who are allergic to dogs. 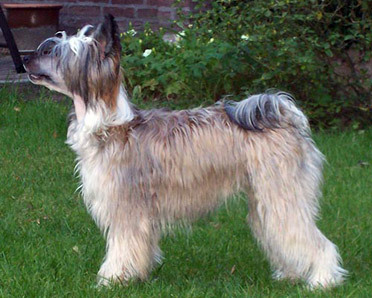 Chinese Crested do barely shed and they also do not have that specific "dog-odour". I do advise people who want a Chinese Crested because they are allergic to other breeds, to visit people with Chinese Cresteds in real life. 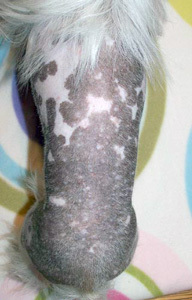 Some people are allergic to the dead skin parts which come of every animal, including Chinese Crested. Smooth, without excess wrinkles. Distance from base of skull to stop equal to distance from stop to tip of nose. Head presenting graceful appearance with alert expression. Slightly pronounced, but not extreme. A prominent feature, narrow in keeping with muzzle. Any colour nose acceptable. Tapering slightly but never pointed, lean without flews. Cleanly chiselled, lean and flat, tapering into muzzle. Ideally beginning at stop tapering off down neck. A long and flowing crest preferred, but sparse acceptable. So dark as to appear black. Little or no white showing. Medium size. Set wide apart. Set low : highest point of base of ear level with outside corner of eye. Large and erect, with or without fringe, except in Powder Puffs where drop ears are permissible. Rather broad and deep, not barrel-ribbed. Breast bone not prominent. Brisket extending to elbows. Legs long and slender, set well under body. Clean, narrow and well laid back. Hindlegs set wide apart. Angulation of the rear limb must be such as to produce a level back. Firm and long, sweeping smoothly into hock. 28-33 cm (11-13 ins) at withers. 23-30 cm ( 9-12 ins) at withers. Weight varies considerably, but should not be over 5 1/2 kgs (12 lbs). There are a lot of different stories about the origin of the Chinese crested. Due to their hairlessness, many believe that they come from a warm climate such as Mexico or central Africa. One story will tell you they originated from Africa, while an other one tells you they are originated in China, what you should think when you see their name. But all stories differ a lot, even when they all talk about China. Archeologists are reported to have found the ten thousand-year-old remains of a Chinese Hairless Dog. Various accounts claim they could be the ancestor of the Mexican Hairless Dog, evolved from African hairless dogs which were reduced in size by the Chinese, or the breed was developed in America in the late 1800s. So you see, there are lots of stories. 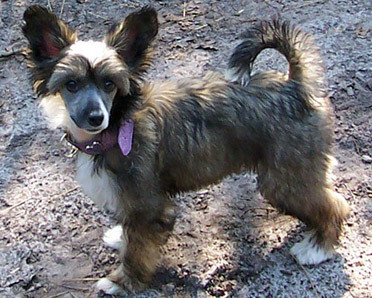 The Chinese Crested originated in Africa where they were called "African Hairless Terriers." The ancient Aztecs kept them as bedwarmers, and believe it or not, did eat them. The Chinese trading ships stopped along Africa on their routes, and it was there that they picked up these dogs because they were excellent for aboard their ships. They renamed the dogs "Chinese Crested" and the name stuck. There a multiple stories about the Chinese cresteds originating from China. I tried to make one story out of them all because for the biggest part they are all the same. It is reported that for centuries Chinese sailors sailed the high seas with the breed on board, and that puppies were frequently traded with local merchants at port cities. 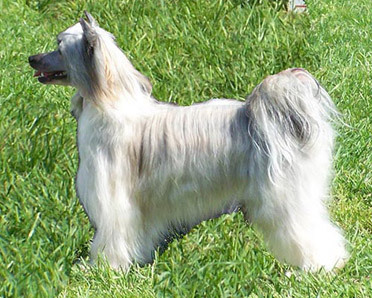 Spanish explorers found the Chinese Crested in Mexico and other parts of Central and South America. British and French explorers also found the breed in various parts of Africa and Asia during the 1800’s . 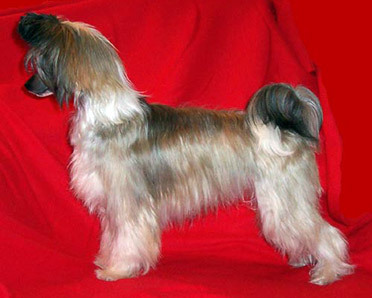 The name “Chinese Crested” is actually a misnomer, for in reality the breed was developed in America in the late 1800s. The first “Crested-type” hairless dogs probably resulted from experimental crossbreedings between hairless Xolos and various longcoated Toy breeds. Although some interest existed in the resulting mixture, these dogs remained purely a curiosity of the dog fancy for many decades. Not until the 1950s was any concerted effort made to establish the Chinese Crested as a true purebred dog. 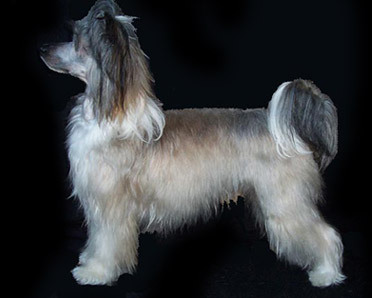 Some other names for the breed are Chien Chinois à Crête, Chinesischer Schopfhund, Perro crestado chino, Perro Crestado de China, Hiina Harjaskoera, and Kiinanharjakoira and Chinese Naakthond. Nothing is more important then the health of your dog. In my Kennel health is very important. 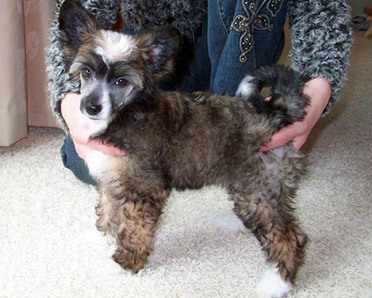 Fortunately chinese crested dogs are overall healthy little dogs with little hereditary diseases. 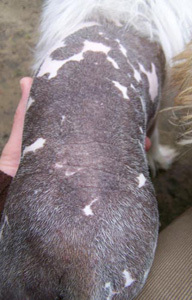 The most common are Pathella Luxation and PRA which occur in almost all small breeds. You can find more information here below. I test my breeding dogs on hereditay disease as Pathella and PRA. “Patellar” is latin for “knee cap” and the term "luxating" means out of place or dislocated. Patellar Luxation lituarly means dislocated knee cap. This dislocation of the knee cap can be either toward the inside (medial) or outside (lateral) of the leg. Grade 1. Patella can be luxated manually (by the examiner) but returns to it’s normal place when released. Occasional luxation occurs causing the animal to temporarily carry the limb. Grade 2. Patella can be easily luxated manually and remains luxated until replaced. Luxation occurs frequently for longer periods of time, causing the leg to be carried or used without full extension. Grade 3. The patella is permanently luxated, but can be replaced manually. The dog often uses the leg, but without full extension. Grade 4. The patella cannot be replaced manually, and the leg is carried or used in a crouching position. Extension of the stifle is virtually impossible. Clinical signs of patellar luxation vary depending upon severity and chronicity of the disease and may develop soon after birth or generally after four months of age. With mild forms of luxation, the knee cap occasionally slides of. This form is called: Habituale Patellar Luxation. The dog may occasionally pick up the affected leg when he runs. The knee cap is only dislocated for a very short period of time. After a few steps the knee cap shoots back to his original position and the dog walk like normal. The dog does not seem to be in any pain. As the disease progresses, animals may present with increased lameness with a decreased ability to jump. Pain is usually not associated with this condition unless it is the result of trauma or until degenerative arthritis has occurred due to chronicity of disease. Some pets can tolerate this disease for many years, some for all of their lives, with minimal consequences. However, this weakness of the knee joint can predispose the knee and even the hip joint to other injuries such as degenerative arthritis and torn knee ligaments, both painful conditions. Luxated patellas are a congenital (present at birth) condition. The actual luxation may not be present at birth, but the structural changes which lead to luxation are present. This can be because the bone growth is abnormal. Normally the leg wil grow in a straight line. In severe cases of patellar luxation the upperleg is twisted and the crista tibiae is not positioned in the middle. This alters the movement of the knee cap and is therefore more likely to dislocate. If the groove that the patellar ligament (knee cap) rides in is too shallow or if the distal attachment of the patellar ligament is medial instead of central, the patella will dislocate medially when the knee is bent. Most researchers believe luxated patellas to be heritable (inherited) as well, though the exact mode of inheritance is not known. If the groove that the patellar ligament (knee cap) rides in is too shallow or if the distal attachment of the patellar ligament is medial instead of central, the patella will dislocate medially when the knee is bent. Walking the stairs, jumping and other moves have no influence on the accurring of patellar luxation. 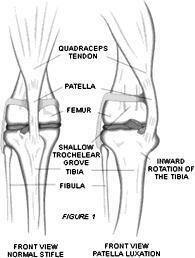 Besides this musclepower plays a big role to keep the knee cap study. A dog with strong opperleg muscles can manage very well, despite a bad knee. The position of the legs is usually different. Patellar luxation is most common is small breeds. Sometimes only one knee is involved, but the disease can become bilateral (involving both legs) in 50% of cases. Treatment involves surgical correction of the deformities. Many techniques are available depending on the severity of the condition. Satisfactory results are usually obtained if the joint degeneration has not progressed too far. After surgery a support bandage is placed around the leg to help with post-operative swelling and support. If the surgery is performed before arthritis occurs, the prognosis is excellent and your pet should retain full use of his leg. However, if arthritis has already occurred, the joint will still be somewhat painful. Some arthritis can occur even post surgery. However, the amount of arthritis will be lessened with surgery. Recovery time post-surgery is varied and depends upon weight and age of the pet, pet’s physical activity, and degree of involvement of the surgical procedure. Most pets will begin toe-touching in 2 to 4 weeks. Recommend ice packing for 15-30 minutes every 8 hours for 3 to 5 days after the surgery. Also recommend passive physical therapy (range of motion exercises) of the knee joint as soon as the pet will tolerate it. Once the condition is repaired, most affected individuals make satisfactory pets. Progressive retinal atrophy or degeneration (PRA or PRD) is the name for several diseases that are progressive and lead to blindness. It is found in over 100 breeds of dogs. It is an inherited condition and affects the retina of the eye. The retina is a thin layer of neural cells that lines the back of the eyeball. The retina is part of the central nervous system (CNS). It is the only part of the CNS that can be imaged directly. The retina contains photoreceptor cells (rods and cones) that respond to light. Here is a very simple explanation of the process by which a dog "sees": Light passes through the lens and is directed onto the retina, which contains specialized photoreceptor (light-sensitive) cells called rods and cones. These cells convert the light into electrical nerve signals, which pass along the optic nerve to the brain, where they are "translated" into images. ~ rods are responsible for vision in dim light i.e. night vision. ~ cones are responsible for vision in bright light i.e. daytime and color vision. Normally, the photoreceptors in the retinas develop after birth to about 8 weeks of age. The retinas of dogs with PRA either have arrested development (termed retinal dysplasia) or early degeneratation (deterioration) of the photoreceptors. Retinal Degenerative dogs are affected from one year to eight years of age and the symptoms progress slowly. Signs may vary depending on the development of PRA and its type. The eye of an affected dog will look normal. PRA is also non-painful. You may start to notice signs of night blindness, which is characterized by not wanting to go down stairs or down a dark hallway. During the day it is as though their vision will seem normal or improved. After some progression you may notice pupil dilatation and reflection of light from the back of the eye. With some dogs the lens may look cloudy or opaque. If PRA progresses slowly, you may not even notice the symptoms. Unfortunately, there is no cure or treatment for PRA, nor is there a way to slow the progression of the disease. Dogs seem to adapt to the progressive blindness and often perform normally in their environments. The blindness is more pronounced when the environment is changed. CAN PRA BE DETECTED AND PREVENTED? Depending on the form of PRA, characteristic changes in the retina can be observed by examination by a veterinary ophthalmologist and the dog can be certified as FREE thru the CANINE EYE REGISTRATION FOUNDATION (CERF). But PRA has a genetic component. DNA is being used to identify which genes are responsible for PRA. Progressive Rod-Cone Dysplasia (PRCD), is the most widespread form of PRA. It is important to test your dogs at six months of age to identify if they are suffering from PRA. PRCD starts with night blindness and progresses to total blindness at 3 to 5 years of age. Researchers have developed a genetic test that identifies a set of genetic markers which usually indicate the presence of the gene mutation that causes this disease. Even though the exact gene has not been found, each and every dog affected has two copies of this genetic marker and every dog that does not carry these markers are clear of the disease. A carrier has only one copy of the defective gene and will not go blind, but it can pass on the gene to future generations. Currently there is no cure for PRA or PRD (prcd). The only way to avoid it is to perform the test on all your breeding stock in hope of avoiding breeding it into the offspring. At present the testing is only available in the UK, by blood samples taken and submitted for testing to a specialized laboratory. Testing in the USA is still being developed. After blood sample is tested by a lab the dog can then be classified as normal, a carrier, or affected. Your breeding programs can be re-evaluated after the results have been received. Dogs that are tested Clear or Normal and Carriers can still be used for breeding but dogs tested as Affected should not be bred together. The majority of breeds affected by PRA, the mode of inheritance is known or thought to be AUTOSOMAL RECESSIVE. 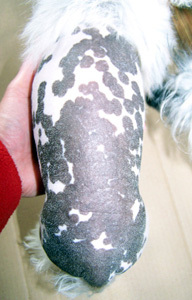 PRA in all breeds so far studied is an autosomal recessive disorder. That means that to be affected a pup has to receive one copy of the defective gene from both parents. Thus both parents of an affected pup must be either carriers or affected themselves. Similarly, because affected dogs have two copies of the defective gene, all their progeny will be at least carriers. Breeds with a genetic marker - (autosomal recessive mode of inheritance). The advantage of having a genetic marker for PRA is that breeders know the status of the dogs they are breeding, (if they are tested). This means that carriers, and even affected dogs, can be selectively used in the breeding program, without the risk of producing puppies that will eventually go blind as a result of PRA e.g. 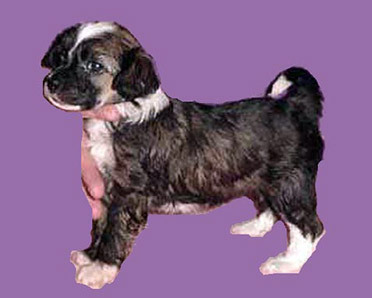 "safe" mating with known status dogs, are those that produce only normal or carrier puppies i.e. 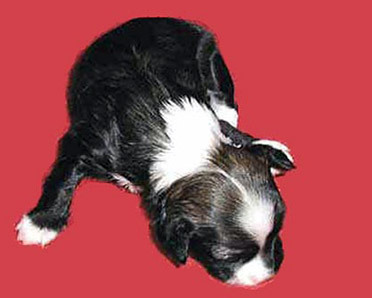 UNSAFE matings with known status dogs, are those that can produce affected puppies, which will eventually go blind, i.e. My opion is that you do not need to use prcd-PRA carriers or affected dogs to breed, because the percentage of carriers/affected is very low in our population. I will have my dogs tested for prcd-PRA before I will breed them. I will place the outcome of the tests on my website.